Our outdoor wedding got rained out at the last minute. The ceremony photos and photography hour I had envisioned went right out the window! This did not seem to phase Michael or his team at all. He took over and told us where to stand and what to do to have amazing wedding photos. The photos are absolutely fantastic! He had me all my edited photos within two weeks of the wedding! His team member even solicited an umbrella from a stranger for a couple of pictures when the rain had died down to a sprinkle- some of the best photos are with that random umbrella! I had one of those weddings where nothing went according to plan, Michael and team came in and displayed a high level of skill and professionalism that helped make everything turn out wonderfully! I highly recommend him! Michael and his team were excellent! They made us feel very comfortable and he knew what my fiance (now wife :-)) wanted for the next picture before she even had to say anything. They went above and beyond to capture the last bit of sunset and made sure we got the pictures we truly wanted. They were capturing all the moments whilst not physically being in the middle of it all, which is a talent in itself! Highly recommend Michael for your wedding and if you can combine it with Sherri as your wedding planner who is his wife. Michael is awesome!!! Highly recommend! My husband and I had our wedding on 10/23/16 at Henderson Park Inn. Michael has such a great personality and was great to work with! He did a great job with getting every special moment and was so nice! He really took the lead with getting everyone together for the perfect moments! Also, thank you for encouraging me to purchase the video of our ceremony! As the Bride, you really don't get to capture all the special moments. Also, We will be able to watch us saying our vows whenever we want. We're so thankful that we will always have it! ! I will cherish it for my lifetime and the wonderful pictures! Thank you! Michael K was amazing! He was such a wonderful, upbeat person to work with. One of the nicest people that I have ever met. I would highly recommend him to anyone getting married. Super talented artist. Michael K and his team were awesome at our wedding at the Henderson Park Inn. His company even did the video. His prices are very fair especially considering everything that is included in his photography services. My husband and I were very pleased and we would highly recommend him. I was fortunate enough to book Michael Kuhn (Michael K) to photograph my wedding at the Henderson Park Inn on 4/11/14. I am so thankful God steered us in his path, because his skills were so far beyond what we dreamed was possible on our budget. He showed up early, introduced himself to us, and we instantly felt at ease with him. I cannot express clearly enough how comfortable Michael made us feel, so much so, that we barely noticed his presence. He made us so at ease that he was able to capture the most gorgeous wedding pictures I have ever seen. I just got our photographs delivered online to view and order just two days ago, and I have no idea how to choose my photos! Each picture is better than the next! I sat down to edit them and pick favorites, and I selected half of my more than 500 amazing pictures as favorites! And honestly, I cannot stand that I cannot purchase the other 250 or more I did not select as favorites, because they are still stunning all on their own! Michael has a skill of blending into a crowd, and that skill gives him the opportunity to capture the most gorgeous candid, precious shots you have ever seen. I urge you to look no further when booking your wedding photography services in the Destin area. Michael K Photography is an amazing vendor, and Michael Kuhn is an artist! I am so thankful we had a wedding planner who led us to his services. We will cherish Michael's grand photographs forever. Great guy! We used Micheal for our videography. He was very professional and work very well with my photographer! Michael K was an amazing photographer. He is great at directing people into positions for excellent pictures. He has some great equipment and was never annoyed if people bothered him for a certain picture. Michael is a great guy and he is very very good at what he does. 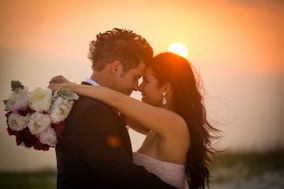 If you are getting married in Destin picking Michael K is a no brainer!!!! Thanks again Michael. Michael K. was truly AMAZING to work with!! My husband and I felt totally at ease with him, which I was so thankful for. He is so friendly and laid back! We just received word this weekend that we could view our pictures online that he took, and I can honestly tell you that they are absolutely BEAUTIFUL!!!! I was THRILLED when I saw them, and so was my family. The photos taken were beyond my expectations! Michael, in his very discrete way, captured our unique personalities in such an amazing way!! I cannot wait to order my wedding album, and other pictures! The only problem is going to be which ones to choose :). Please go no further in looking for a photographer who can capture your special moments...you'll be thankful you chose Michael K!! Michael and his wife Sherry are gold stars in my book. Even with it pouring down rain they made me feel and look like a princess. My father, not usually ones to give complients, couldn't stop talking about these two! He was so impressed with their vision and work ethic. They were there for all the shots but kept out of the way of the party.... They aren't like usual photographers that like to be in the way and in your face. They took beautiful shots!! Loved loved Loved them!! Michael was a great photographer for my wedding. He didn't miss a moment and listened to what shots were important to me and made sure he squeezed in every picture that I wanted to take. He is very friendly, fun, and was courteous to my guests. He worked even in the rain to make sure he didn't miss a moment. I would definitely recommend him to any bride-to-be. Michael is great to work with, he is so laid back and provides a stress-free atmosphere when taking your pictures. We were more than pleased with our photos, they turned out amazing!! Thanks so much Michael! Michael and his team were INCREDIBLE!!!! He saw the vision of what I wanted out of my wedding day photos, and made everything possible! He was very professional and made sure that every picture that I wanted was taken! He and his wife were so much fun to work with! 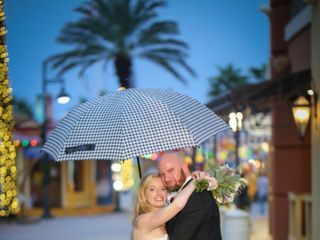 Michael and his assistant Amanda did our wedding at the Emerald Grande in Destin, FL and they did an amazing job. I corresponded with Michael primarily through email, as we lived hours away and were only able to meet in person once before the big day. Michael was easy to work with and tons of fun. We had some last minute changes to some picture locations and he was more than willing to just roll with it and do whatever we wanted. After the fact, our pictures took a little longer than we were originally told to get to us, but Michael was great about keeping in touch and trust me, the pictures were more than worth the wait! We received close to 900 images from our big day, and between him and Amanda they captured everything we could have ever asked for, we had all of our portraits, tons of candids, and tons of detailed shots of everything you could think of, from my dress to our welcome bags, to the reception tables, to our personalized do not disturb sign. We are absolutely in love with our pictures and would highly recommend Michael to any couple looking for a great photographer! Michael K Photography has done such a great job on my reception pictures. They remind me of the pictures you see on websites and in magazines. I was so shocked and amazed. Although two weeks passed before I was able to view the proofs, it was definately worth the wait. If I could undo one part of our wedding, it would be selecting Michael K as the photographer. From not returning emails to not releasing our photos, Michael K was hands down the worst wedding vendor I worked with. Michael was truly a nice guy to work with … up until he got paid. But as soon as we signed the contract, the honeymoon was over. He became virtually unresponsive, and on the day of the wedding he flubbed the timeline, forgot the shot sheet and flew through the photos. Everything considered though, my biggest disappointments with Michael K came post wedding. I didn’t feel his artistic expression shined through in our wedding photos, and after requesting the link to digitally download the images … I never heard back from him. A week passed, our gallery expired and no response. I reached out time and again, I called, I emailed, I left messages and still no response. I got back in touch with my wedding planner to ask what to do. She called him, she emailed him, she didn’t get a response. This went on for four weeks. Ladies … I was Google Mapping his home address and figuring out if there was enough room to set up a tent on his front lawn and stage a sit in until I received my photos. True story. I was dumbfounded and irate. It blew my mind that you could pay someone thousands of dollars for a service, without them having any expectation of ever delivering a product. Long story short, a bit of Google sleuthing and one call to his wife to tattle on him that he hadn’t released our photos ... and that night I had a download link to our photos. No personalized message, no apology for trying to scam us out of our wedding photos, but a link to our gallery. This guy is a real piece of work. I have no idea how he remains in business after providing such abominable and disreputable service or how he has racked up 15 5-star ratings on Wedding Wire. I would never recommend him in a million years.